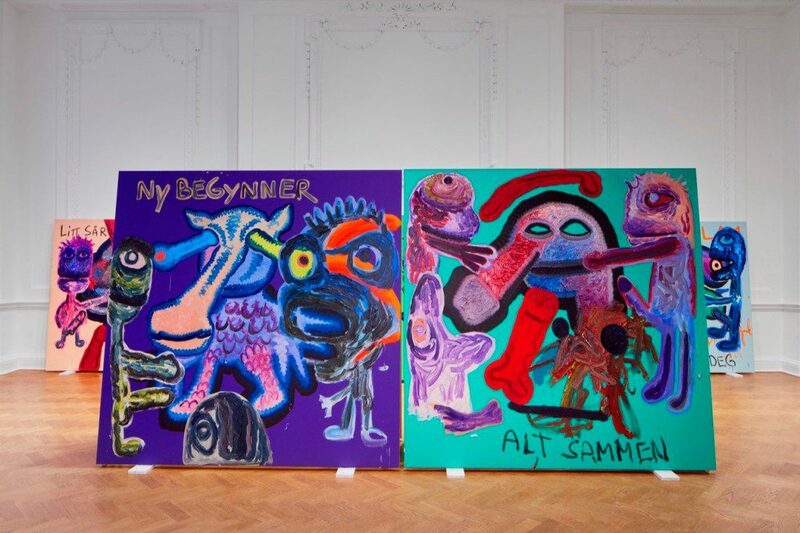 The controversial Norwegian artist Bjarne Melgaard is currently exhibiting at Galerie Thaddaeus Ropac in London. He talks to Norwegian Arts about his identity, his newfound mellowness and why he thinks painting is as important now as ever. Melgaard’s current exhibition, which opened on 23 February at Galerie Thaddaeus Ropac, London, is by no means as controversial as many of his earlier offerings – which have seen him variously accused of racism, paraphilia and paedophilia. Showing alongside an exhibition of works by Sturtevant, Melgaard’s solo show – his first with the gallery in London – sees the 17th-century Ely Room filled with a suite of 14 new paintings, Bodyparty (Substance Paintings), each 180x180cm. Because of the age of the building, the heavy canvases could not be hung on the walls, and so they stand about, propped up on marble blocks. Melgaard, however, likes this ‘improvised’ feel, echoing the ‘casual easiness’ with which the works stand on the floor in his studio, and describes the whole coming together of the exhibition, proposed to him ‘at very short notice’ by Ropac’s new senior global director, and former director of Serpentine Galleries, Julia Peyton-Jones, as ‘very organic and very fast’. Life in Norway is quite different. Melgaard has a much closer dialogue with his immediate audience and people stop him in the street to ask questions. At the same time, he no longer has assistants helping him in his studio and his Bodyparty (Substance Paintings) capture something of the loneliness of being an artist, a theme also picked up by the Instagram project. ‘I think the substance of social media is a bit sad and lonely – this need to constantly document everything you do for people you don’t even know, to post selfies, and to check back for approval – I don’t understand this urge. It’s very empty and it’s not very intellectually challenging. And when you see who has the most followers, it’s really very depressing.’ Melgaard’s own account, incidentally, features a mixture of pictures of his paintings, his mother, his hairy chest, and his French bulldog Freya. Melgaard was born in Sydney to Norwegian parents, raised in Oslo and studied art the Norwegian National Academy of Fine Arts, Rijksakademie in Amsterdam and the Jan van Eyck academie in Maastricht. Melgaard is seen as one of Norway’s most controversial artist through his provoking paitings, installations, photo- and video art.